My son’s nursery is my peaceful space. While Marri is napping on my lap, it is a quiet oasis where I gather my thoughts and plan my mommy duties for the day. That is, however, until he wakes up! Then it is the perfect area for us to walk, run, play and lounge. Marri’s nursery is one of my favorite rooms in our home thanks to the considerate and intentional planning of Deena Knight In teriors. It is our space that is functional, nostalgic and constantly reminds me of the blessing of my little angel. While pregnant, I remember sitting on the floor looking at endless gift boxes that we received from friends and family via mail and at his shower. At the time of his birth, I did not have the time or energy to set up his nursery and we were transitioning into our in-season home so we did not need the space immediately. But, that did not erase its impending sentimental value. I remember feeling sad because every new mom (especially first- time moms) want to have all of their baby’s items in order both organized and color-coordinated in his or her nursery. We didn’t have that during the season. However, once we returned home for the offseason, Deena had transformed this “dry” room full of boxes into an open space with every inch of the room designed for teaching, fellowship and interacting. I wanted this room to exist as a fun space that was able to grow with Marri as he aged. I imagined his little friends (his cousins) coming over to play with him and enjoying his own little oasis of toys and activities. A playground created especially for play and exploration. I pictured his bedtime routine in his nursery. 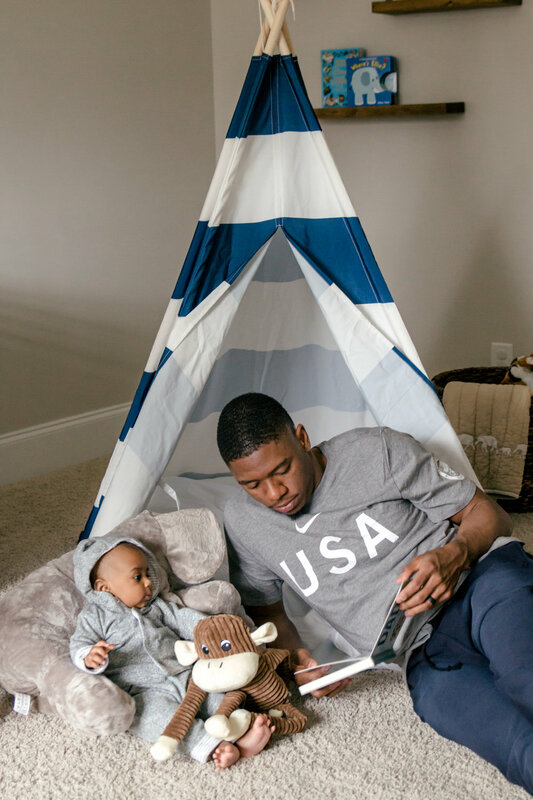 Af ter a bath and a good rub down, I imagined little Marri and his dad hiding in his teepee reading books from his collection in his mini library. Deena capitalized on the features of this space and designed it perfectly. The room is vast in size so she was able to create designated areas that had specific functions. Each area is designed for a different action and activity. It helps keep the room functional for a toddler and his over organized mommy. Deena has a knack for creating multiple functional spaces in a room so when I asked her to create a sitting area, she curated the perfect lounge for late night snuggles. The lounge consists of the cutest sofa from Wayfair, with customized accent pillows stitched with Marri’s name from RH Baby and Child and an adorable elephant table from Pottery Barn Kids. She also incor- porated the “Grow with Me” table from Pottery Barn Kids with storage carts. It currently serves as a coffee/play table (with lit- tle mini ottomans for additional seating) but as Marri grows up then taller legs can be added to allow it to transition to a craft table. The storage carts will be great for storing LEGO(s) and Matchbox cars. With our travel schedule, I did not want a traditional crib that Marri would grow out of quickly. So Deena chose a 4-in-1, tran-sitional crib from Pottery Barn Kids. Ultimately, the side rail becomes a full-sized headboard allowing Marri to keep the same bed well into adolescence! While we didn’t want a “theme” per se, I’m obsessed with murals of continents and Deena found one really special on Etsy. My husband and I love to travel! Our goal is to take our son to every continent by his 10th birthday. What better way for him to learn about the world than to study a cool mural overlooking his crib? My husband loves to read and every since Marri’s birth, he has read all kinds of books to him, at least 30 minutes a day. Deena transformed the most precious teepee and created his reading nook. It is accompanied with shelves and a cute sitting area for his dad and his stuffed animals to enjoy a good book. Eventually, Marri will be able to use this space for his own quiet time too. Deena added a detachable changing table from RH Baby and Child to Marri’s trunk dresser, another nod to our world traveler theme. Changing tables are great to have, especially with a little baby because they save us from having to bend over to tend to them. We use this for diaper changes and post-bath moisturizing because we all know that Marri stays “good and greasy!” She also hung hooks within arms reach for holding hooded towels and jammies. As Marri grows, the changing table can be removed and will be left with a dresser that he will be able to use well into his teen years. Deena added a detachable changing table from RH Baby and Child to Marri’s trunk dresser, another nod to our world traveler theme. Changing tables are great to have especially with a little baby because they save us from having to bend over to tend to them. We use this for diaper changes and post-bath moisturizing because we all that Marri stays good and greasy! She also hung hooks within arms reach for holding hooded towels and jammies. As Marri grows, the changing table can be removed and will be left with a dresser that Marri will be able to use well into his teen years. Who wants to compromise style for safety? DEFINITELY not Deena Knight! She worked with a local carpenter to design cus tom baby gates that were installed at the top and bottom of our spiraling stairwell. This is so helpful to keep Marri and CJ safe as Marri has become more mobile over the past few months. She also matched the interior of our stairwell which makes them functional yet, still chic and stylish. For more design and style inspiration follow Deena Knight Interiors!